There is a difference between stalled project and delayed project. a. Legal issues : This is the extreme case, where the great "Sam, Dam, Dand Bhed" principle fails to work ... Adarsh society, the tall building between Dahisar and Mira Road, the two tall buildings in Goregaon film city road and so on. It can happen to any builder, small or big, reputed or tainted. b. Fraud builder : From the very beginning, these people has ill intentions. They are for quick gain, not for longer term. Generally smaller builders falls under this category, none of the big builders will be in this category. c. Going Burst : These are the builders, who want to be BIG in very short time... they swallow more than they can bite. Many of the NE builders immediately comes in mind. Not fully true. I myself is an end user and I love delay as I do not have immediate plan to move in, neither I will rent out my brand new apartment to a stranger. Many people never like the idea to rent out a brand new apartment to someone ... specially when that house is meant for their own stay. Yes it does not make any economic sense but this has to do with tradition and belief. And I have reason to believe that I am not alone. If you look at any typical complex... not more than 20% owners move in immediately. In other words, just around 20% owners are desperate to move in. 20% inventories are still with the builders and they sell gradually and those people move in gradually as and when sales happen. Other 40%, who purchased earlier, move in gradually, typically over a period of 1 to 2 years time.... many reasons such as auspicious muhurt, school, job, etc. The remaining 20% remain vacant for long time... either completely locked or some seasonal people/tenant comes in and goes out. And this is one reason, builder delay their project... they want to make majority of the customers happy. I am in the same boat, but I consider myself a long term investor. If you buy a flat you are going to need 15 years later only, that makes you a RE investor - you are buying today for the distant future. You can either sell the flat after 15 years or stay in it, you are acting like an investor only - and since you are depending only on capital gain and not rental gain, you and I are both not even investors but speculators. (buying any asset without underlying yield based on value going up is a speculation - investment is buying an underlying yield - interest, divident/earnings or rent. SO buying futures/options, gold, unrented RE are all speculations). Nothing wrong with speculation. And yes, most of Sohna Road, Dwarka and other newer flat complexes are full of flats bought for future use and are lying empty. Who wants the headache of a tenANT? So slow construction makes majority happy. Ideally builder should be interested in quick delivery because he gets better revenue and cost of construction going up can be a problem. Good analysis. Yes, delay and stalled are two different things. Strange, but all three reasons are applicable to NE !!!! Land is in dispute, permissions are dodgy, govt is backtracking to prevent election loss, courts are interfering, builders were mostly small time and probable frauds, many have unviable economics and can go bust at any time. Travini project in Faridabad is Stalled project sale the project in the year 2006 still construction going in for few towers. Sir I have seen incomplete building in front of American Bank at Barakhamba Road before Lalit Hotel Connaught Place same condition from 1985.
:D:D:D , I see this building every time whenever I cross CP once in a fortnight , or in a month. 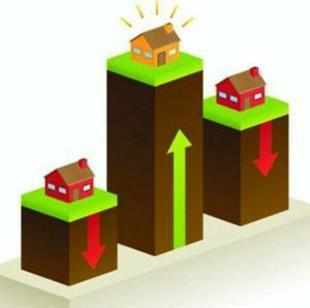 and several time I also think why it is like that at worlds costliest land rate location. No initiative to get it finish. Construction work going on for four towers out of 20 and 16 tower still in basement. Nearly half of the 323,000 homes to be delivered in 2013 are lagging behind construction schedule, with a third not ready for a housewarming before 2014. NEW DELHI: Here's a shocking piece of news for those waiting to take possession of their homes next year. A new survey has found that nearly half of the 323,000 homes to be delivered in 2013 are lagging behind construction schedule, with a third not ready for a housewarming before 2014. In addition, nearly three of every four homes promised for delivery in 2014 are also likely to be delayed, real estate research firm Liases Foras has found in a nationwide survey conducted recently. "There have always been delays, but it is a bigger concern today as the quantum of homes being built is much larger now," says Deepak Parekh, chairman of India's biggest mortgage lender HDFC Ltd.
"Everyone's money is stuck. It is not only bad for homebuyers, but also for the economy," adds DK Mittal, secretary, department of financial services. The problem that began in 2010, when the economy started to weaken, has aggravated in the last one year due to paucity of funds as well as delays in securing approvals. Home sales have slowed down, private equity has dried up, the primary market is subdued, and banks have been reluctant to lend to builders. A combination of consumer activism, agitation by farmers, bureaucratic delays, labour shortage and legal wrangles has also contributed to holding up projects. The delays leave lakhs of homebuyers to grapple with another problem in the midst of rising prices and a slowing economy. "Individual homebuyers have the option of taking recourse to the law, but almost no one does so as it is a cumbersome process and may lead to further delays if the builder digs in his heels," says Vaibhav Gaggar, partner at law firm Gaggar & Associates, which helps clients in real estate disputes, among others. "If they choose, buyers could invoke a clause that is part of most standard contracts, to terminate the contract and get back their money with interest. If the person chooses to retain the property, he could file for compensation and damages by proving that he has been injured financially," added Gaggar. At present, contracts between buyers and builders provide for a per sq ft compensation in case of delays. "But the amount is minuscule," he said. 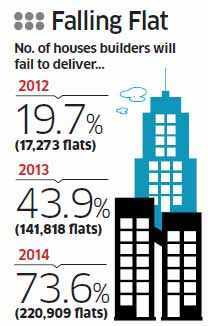 Builders in the Delhi-National Capital Region have been the biggest culprit, with a 74% late delivery rate, followed by Mumbai and Chennai at 61%, Bangalore at 59% and Kolkata at 57%. "Data indicates that there would be more delays going forward because of the stress on cashflows of developers," says Pankaj Kapoor, managing director at Liases Foras, the firm that carried out the survey. This non-brokerage real estate research and rating firm services banks like HDFC, Axis Bank, Deutsche Bank and Standard Chartered as well as big real estate companies and private equity funds. Experts say there are liquidity concerns both on the supply and demand side. Many developers are faced with a liquidity crunch and cashflow issues due to slowdown in home sales, and this is turn is impacting their ability to finance construction of new properties. "Home sales are down nearly 40% because of the very high cost of homes. This is becoming a vicious cycle," says Anckur Srivasttava, who heads GenReal Property Advisers, a property consultancy. Adds Anshuman Magazine, managing director of CB Richard Ellis: "There is a liquidity concern on both the supply and demand side due to high interest rates and high prices. The impact of the slowing economy is reflecting on the ground now, in demand slowing down and execution of projects being hit." According to a recent report by real estate consulting firm PropEquity, the number of unsold properties in India's top seven cities at the end of December this year is expected to be around 32,000 units and valued at over Rs 21,000 crore. Developers argue that liquidity issues are just one of the reasons for the delays. More pressing is the issue of getting approvals on time to get on with construction. "After the first approval, subsequent no-objection certificates and approvals like water, electricity connections, completion certificate and others get delayed," says Lalit Kumar Jain, president of the Confederation of Real Estate Developers Associations of India (Credai), the national association of builders. The regulator will, however, have the right to give an extension to the builder on a case-to-case basis.